Cherimoya – South American Bomb: Probably The Healthiest Fruit In The World! Cherimoya, or the South American bomb, is believed to be the healthiest fruit in the world. It originates since the time of ancient Inca, when it was reserved only for the rulers. Cherimoya grows in the valley of the Andes, at an altitude of 1500 meters, from Colombia to Peru. Since it can submit lower temperatures, it has spread to other warmer regions of the world such as Israel, Chile, California, Spain, Brazil and Mexico. It can grow up to 8 meters in height. It has thorny and yellow-green skin, which surrounds a white meat inside. Seeds, about 10-20, found inside the fruit are not edible because they are toxic. 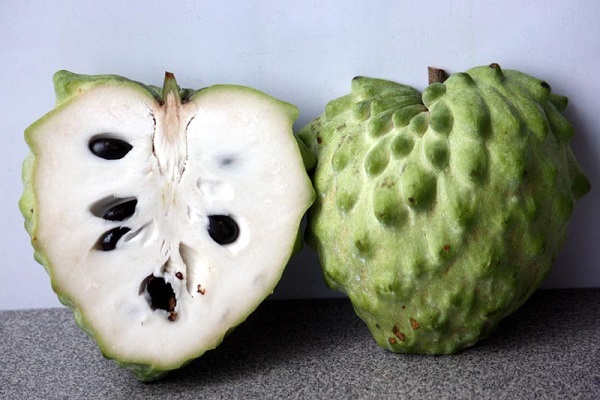 Cherimoya is very nutritious and contains carbohydrates. It is also abundant in vitamin C, B1, B2, as well as calcium, iron and phosphorus. This fruit can help against bladder and kidney inflammation. Before consumption, the fruit is cut in half, and its meat is eaten with a spoon. Its taste is similar to coconut, pineapple, banana and papaya. The taste can be enriched with lime juice, but it is probably for the best not to add anything, in order to enjoy its unique taste. The fruit must not be kept in the refrigerator, so it should be consumed immediately. It does not tolerate temperatures below 14 degrees. In addition, you can use this remarkable fruit as an addition to different salads or as an addition to meals. Just like avocado and kiwi, cherimoya relents under pressure of fingers when ripe. Therefore, cherimoya fruits are harvested while hard, due to the fact that they mature at room temperature, in the sun. Always take care not to buy squashed and brown fruits, for that marks the end of their shelf life.